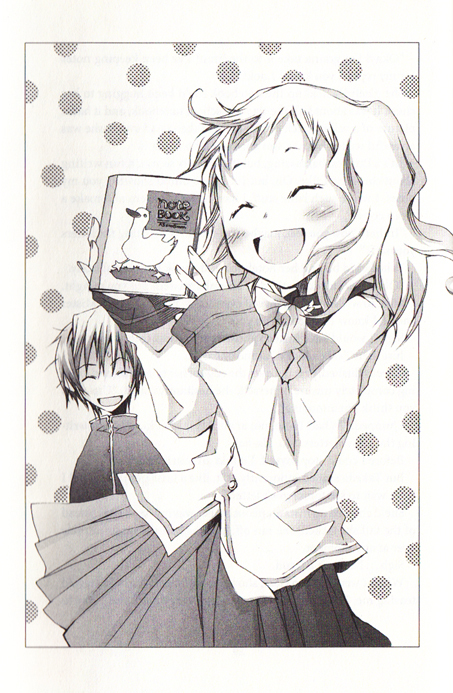 Oh, Yen Press. Oh, how I love you; oh, how I hate you. I love the money and effort you put into publishing your books. I love that you took a chance on titles like Black Butler and succeeded remarkably. I love that you turned garbage like Maximum Ride and Cirque du Freak into readable and artistically beautiful graphic novels. I love that you found room in your capitalistic heart for series like Bunny Drop and One Fine Day. I love how you don’t put Japanese manga-ka on a pedestal but instead give equal attention to Korean and American artists. I hate that you stopped publishing the paper-and-ink version of your monthly magazine. I hate that I can only access the digital version from your website even after I pay for it. I hate that you sent cease-and-desist orders to scanlation sites but then decided to launch your digital titles exclusively on the most expensive e-reader on the market. Actually, let’s just leave it at that. There’s no need to copy the full paragraph. Glistening tears leaving black ebony trails of eyeliner down a tragic alabaster face – you get the picture. Maybe I would be more patient with such things if I were seventeen; but I’m ten years past seventeen and not quite as intrigued by alienated narcissism as perhaps I once was, regardless if said narcissism is a deliberate homage to Dazai Osamu. And so it was that Book Girl fell off my radar. What made me leave my desk and walk straight to Borders to pick up a copy was Erica Friedman’s glowing review of the second book in the series, Book Girl and the Famished Spirit, over on Okazu. If the series is that good, why shouldn’t I read it immediately? And so I did. Suicidal Mime was short and engaging enough for me to read from cover to cover the very evening I bought it, and I did indeed enjoy the experience. 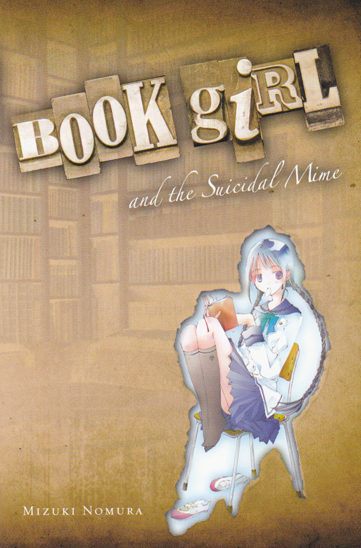 The “book girl” of the title is Amano Tohko, who seems to be an ordinary high school student save for the fact that, instead of food, she consumes the written word. She is the president of her prestigious high school’s book club, the only other member being Inoue Konoha, whom Tohko has drafted to write short, impromptu snacks for her. Tohko’s secret is that she quite literally eats paper with stories written on it, and Konoha’s secret is that he once wrote a bestselling novel under the name of his former girlfriend, who had committed suicide by jumping off the roof of her middle school in front of him. Konoha is taciturn but good-natured, and Tohko is brash but unflaggingly cheerful. The dynamic between these two characters is typical (one might almost say stereotypical) of the genre of Japanese high school comedy, but it’s entertaining nonetheless. The book is plot-driven instead of character-driven, though, and the plot is set in motion with the introduction of Takeda Chia, who asks Konoha to write a series of love letters for her. The recipient of these letters is Kataoka Shuji, an upperclassman on the archery team. As Konoha soon discovers, however, Shuji doesn’t exist. Or, at least, not anymore – he supposedly committed suicide ten years ago, but a letter found inside an old copy of Dazai Osamu’s No Longer Human hints that there might have been more to his death than suicide. The story is thus propelled by three intertwined mysteries. Who was Kataoka Shuji? How did he die? What stake does Chia have in the matter? Playing the role of Sherlock, Tohko knows more than she lets on but sends Konoha on several fetch quests to discover concrete clues. Tohko was perched on a metal folding chair, her knees pulled up to her chest. It wasn’t a very modest way for her to sit. Her pleated skirt was almost wide open – but not quite. If she moved her legs even slightly she would be flashing me. A girl was splayed out on the floor, her skirt flipped up in her fall, exposing her bear-print underwear for all to see. It occurred to me that my little sister had the exact same pair of underwear, but she was only just starting elementary school. As you can probably tell from the above passage, the touch of the translator is feather-light, so reading Book Girl feels really no different than reading “normal” (ie, contemporary American) young adult fiction, save for the eight full-color pages of illustration at the beginning. At $8.99, the book is priced like normal young adult fiction as well, so it’s well worth picking up and breezing through for anyone interested in light novels, young adult fiction, or anime and manga in general. I’m definitely going to order the second volume of the series before my next plane ride. The Famished Spirit is about sixty pages longer than The Suicidal Mime, so hopefully there will be more room for plot and character development. Another mystery-flavored light novel I read recently was the first volume of Sakuraba Kazuki’s Gosick series, which is published by Tokyopop and still (as of this writing) available at a discount through Right Stuf. Like Book Girl (and many of Doyle’s original stories), Gosick employs a Todorovian element of fantasy in that the reader never quite knows if the cause of the story’s improbable events is supernatural in origin. The innocence of the beautiful young female Holmes-equivalent can be grating at times (as is that of Tohko), and there were times I suspected that her “astronomical genius” was only given to her by the author to make her a more desirable prize for the male reader-stand-in protagonist; but, if you can get around that, the first volume of Gosick is an enjoyable mystery novel. The Gosick anime series is currently streaming on Crunchyroll, and it’s worth briefly checking out if only for its gorgeous Mucha-inspired art nouveau opening sequence. Almost completely unrelated to your post, but thank you SO. MUCH. for posting about Gosick and where I can buy it, because I’ve been wanting to read it for months but have been turned off by the secondhand prices (well above the original). Somehow I completely overlooked Right Stuf in my frantic Google searches. I am kind of worried about the “genius girl who can’t tie her shoes without the help of her male companion” thing, though.